By now it's no secret that Tablet PCs are some of my favorite things. On this page, I'd like to share my views and opinions about some of the products I've had the privilege to try. This is one of the few areas in this website where the views are strictly my own. There's no marketing hype, just real life use and experience with Tablet PCs and related applications. I haven't included free products because they're available for everyone's use and you can try them for yourself. All that are available for purchase will be included here as I find something of exceptional value in either price or use. Not everything I try will be included. You'll only find those products that have captured my attention by enhancing the use of the Tablet PC considerably. Some products are enhanced by being used on a Tablet PC and others enhance a Tablet PC by being used. The first Tablet PC I used was an Acer C100 series. This was an amazing experience. I had fallen in love with the idea of Tablet PCs when I saw Bill Gates' keynote at Comdex in 2000. To actually have one in my hands that did everything he said it would grabbed my attention and kept me wanting to know more about it all. One of the results of that was the creation of this website. If you've found a product that you can't be without, or if you've tried one of the following and would like to share your opinions, please email us. After visiting the following, please click the back button to return to this site. This is a hard category since I haven't had the opportunity to try every Tablet PC model. Every one that I've tried, has something good that can be said about it, whether it's the pricing of some of the basic models or the bells and whistles included on others. As I try newer models, I'm sure some of my choices will change, but those listed here will always be special. They're the ones that formed my budding opinions about Tablet PCs and the ones added since are at the top of the list. HP tx2000 - As you could probably tell from my review, this new HP offering is one of my new favorites, primarily due to the fact that it has an optical drive built in but still keeps the weight manageable. This time, HP listened to users and created a Tablet PC that does almost all of it. From the touch screen, much-improved inking and low price, the tx1000 is a Tablet that I've recommended often. Check out the specs and the price, and I think you'll agree that this Tablet PC is more than worthy of being selected as an Editor's Favorite. The first slate model I tried was a Motion M1200. I remember how in awe I was at the Tablet PC Launch. This one drew me to it and kept me going back. It looked sleek, it felt balanced and I liked the larger screen size. It was the only 12.1" slate available at the time and I wanted one, plain and simple. It took a few months to get one and by then I'd decided that I'd made much more of it than it was. When I opened the package, that same feeling came back. I was holding the future of computing. Everything about this machine was first class. The size was perfect for me. Large screen, but no additional weight of a keyboard that I would use only occasionally. Once I plugged it in, I immediately tried the pen and the handwriting recognition. It was smooth and the recognition was very good. The optional docking station made using it with a keyboard and drive simple and efficient. I ran through the speech training once and went to speech mode. Recognition was amazingly accurate considering that I was using a cheap headset and had only trained it once. It was much more accurate than other Tablet PC that I'd trained longer. I tried both machines again since the recognition engines are the same on all machines. I got the same results. The only thing I can attribute it to is that the internal operation was quieter, allowing for better speech recognition. I found that I rarely used the keyboard, but the lightweight of the USB keyboard made it simple to keep in the briefcase in case I just had to have it. I think it was more of a crutch than anything else. The Motion had almost everything I needed onboard - easy to setup wireless, firewire, USB, additional card slots, upgradeable ram. The longer I used it the more I found that I liked and I was still looking for something that could detract from my overall opinion. Over the course of the next few weeks, I found out more about Motion as a company. It may be a new company, but the people there know their business and are determined to make Motion Computing a well-known corporation. So far, they're doing it right. In a way, the Motion M1200 wasn't as good as I remembered it to be. It was better. NOTE: The release of the Motion M1300 with the Centrino technology took the Motion line up another notch. Better speed, better wireless and no loss of battery life, added to all the other things that made the Motion M1200 a first class machine, now make the Motion M1300 the new Editor's favorite machine. The View Anywhere option is great if you use the tablet outside at all, or even in bright indoor lighting. The Motion M1400 with its viewing angle of 170% and the best built-in mic I've seen yet once again has Motion leading the field in slate models. If you need a special dictionary installed on your Tablet PC, then AbletWord Manager is one of the best ways to do so. If you need a medical or legal dictionary, this program makes it easy to import anything from a phrase to a full dictionary for use with the Tablet PC. It can also import dictionaries already in use with Word. AbletWord Manager supports English as well as several other languages. Use the new in-place Tablet Input Panel (TIP) [instead of GoBinder's in-place Writing Assistant] and take advantage of the many improvements in the ink recognition system. If you have installed XP SP2, you're ready to go with GoBinder 2005. This isn't just for students. I've changed a couple of tabs and have made this my favorite organizer for many different things. It's a great piece of software that takes full advantage of Tablet PC capabilities. How do you keep your email with you at all times, no matter where you go and whose computer you're using? I love the portability and ease of use of Email-To-Go. Although this program was originally done to protect privacy (and it does a GREAT job at that), the portability of the USB key drive and this program are a perfect match for Tablet PCs. Email is stored on the pen drive, not the computer, so you can access it from any computer with a USB port. Once set up, your email is as close as the nearest computer and since it's all on the USB drive, there are no trails left behind. This works with Outlook Express. Your email is always up-to-date with no more leaving email on the server or synching multiple machines. This is one of those rare programs that almost everyone who’s used it considers a “must have.” Both press and enterprise have praised it emphatically. Mindjet’s MindManager is definitely at the top of the list in mind-mapping software. Now, there’s a way to increase the value of even this ‘almost perfect’ software – install it on a Tablet PC. No longer is there a need to open a notebook or sit at a desk when an idea hits. Open the Tablet PC and MindManager can grab your thoughts at the touch of a pen. Make notes as you think of them. Diagram almost anything you think of. The tree mode allows websites and other links, which makes it quick and easy to follow your thoughts. It’s a better way to outline an entire project. Point, click and move branches simply and easily from a central idea. You can link to other sources, use filters to both include and exclude criteria. Although there’s a bit of learning involved, MindManager is fairly easy to setup and use. Mapping allows others to use either right or left brain to recognize a project from conception through completion. MindManager allows personalized menus, and those familiar with Windows XP may recognize some of the enhancements. Those who also use Office XP will be right at home with the menus. MindManager includes not only the creation, layout and editing tools of other programs, but several advanced tools such as conferencing. This allows others to collaborate on a project at the same time. MindManager can be synchronized with Outlook and then exported to other Office applications. If you want to take control of your thoughts anytime, anywhere, then it’s going to be hard to beat the combination of a Tablet PC and Mindjet’s MindManager. Keep your desktop and settings with you no matter which computer you may be using. This is one of the most exciting new programs for Tablet PCs as well as desktops that I’ve seen. Optimal Desktop, Mobile Edition works with flash drives, external hard drives and removable hard drives. One of the most useful tools in Optimal Desktop is Tabbed Navigation - store an unlimited number of sites, and reach any of them with just 3 clicks! Optimal Desktop includes a Secure Password Recorder, a Popup Blocker as well as an Integrated Zip Utility, Portal Sharing and the Mobile Desktop, which leaves no information on the hosting computer. Navigate to hundreds of websites with just a touch of your pen. A Tablet PC is perfect for ebooks and now you can get your favorite magazine subscriptions sent directly to your computer by Zinio. You can read them any time, anywhere and not have to deal with what to do with the magazines when you're finished. You can save copies on your computer and easily search for keywords when you want to refer back to an article. Zinio offers a free magazine to try it for yourself. Reading a magazine through Zinio is exactly like its print counterpart, right down to the advertisements. You'll get the feel of reading a paper magazine as you watch the Tablet PC turn the pages for you with just the touch of the pen. Over the years since The Tablet PC was launched, we've found a lot of items that work great with Tablet PCs. Although we don't get to see everything, several that we've reviewed have made the Editor's Favorites list. The Flexity PowerSquid Surge 3000 won the prestigious 2006 Best of Innovations at the Consumer Electronics show in Las Vegas. It's been featured in Popular Mechanics and other publications. The Boostaroo Revolution is a unique portable pocket amplifier for personal audio devices and laptops. It will quadruple the volume of any player to headphones or speakers up to 300 Ohms and provide 3-D surround-sound imaging. See our review on the Boostaroo Portable Amplifier and Splitter. DiskOnKey - Xkey - Xkey incorporates a powerful microprocessor, a database, an application server, an Exchange client, a crypto engine, plenty of flash storage (256 MB) and an embedded SSL VPN for maximal security. All this functionality is packed into an easy-to-use, key-size device. Users simply plug Xkey into their PCs, type in their passwords, and are ready to work. Fellowes - Fellowes has a few things that's made the list. Probably the most important is the Mobile Proximity Alarm. Perfect for those who may not always be holding on to the Tablet, it sounds an alarm when the Tablet is moved more than 15 feet from the controller. Perfect in areas where a Tablet may be too tempting to be left alone by a curious customer or client, or as a reminder when a user inadvertently walks away without it. Battery operated, with a controller small enough to keep in pocket or purse, this is one item that is easily worth the cost. Fellowes offers a large selection of mice, etc., to keep hooked up with a docking station or for the times when using the pen just isn't as practical. My favorite of these is the USB Hub Mouse. This has a USB hub handily located on the back of the mouse. 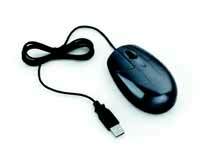 USB 1.1 hub inside a 3-button mouse allows for true office management on the go. It's optical technology allows for smooth tracking and quick response on almost every surface so there's no need to carry a mousepad. The 3 programmable buttons with advanced scroll wheel technology is comfortable to use. FoneGear - Every now and then a product comes along that's unlike anything we've seen before. The best part is when these products not only are release, but work as well as promised. FoneGear's Cord Free Headset surpassed all of our expectations. After receiving an email touting its excellence as an alternative to 802.11 or Bluetooth technology with cell phones, I asked if it would work with Tablet PCs for use with voice recognition. I was surprised when the answer was a resounding YES! Using magnetic technology, it wouldn't interfere with any other wireless protocol available with Tablet PCs. I couldn't wait for CES to try it out. I wasn't disappointed. The clarity of the unit is excellent for use with phones, but the fact that it works with the Tablet is the reason this device has been picked as an Editor's Favorite. Trying the unit at home, I tested it with a fresh setup of speech recognition on the Motion M1300. After using it with just a couple of the available training sessions and I was amazed at the way it worked with speech recognition. I used it with the TV running at normal volume in the background and the noise-canceling microphone did its job and did it well. 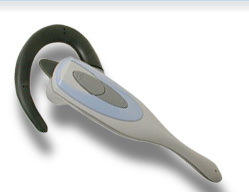 The earpiece is very comfortable to use. After just a few minutes, I forgot I had it on. The unit comes with a connection for some cell phones as well, so it definitely serves a dual purpose. It's lightweight enough to leave on when working with my Tablet, even if I leave to do something else. I can easily switch to using speech without having to constantly disconnect and reconnect a wired headset. In my case, having it work with my cell phone is just an added bonus. Griffin Technologies - There are two Editor's Favorites from this company. The first is Parental Control Key - ControlKey is a new and practical way to protect children from unsupervised online activity and ensure that parents are able to effectively govern PC and Internet use at home. ControlKey combines an attractive, key-like token with sophisticated software technology to ensure professional-strength protection against unwanted PC use in a way that is easy for any parent to understand and use. Children's safety online is of prime concern for parents, grandparents and caregivers. Be sure to check out the guidelines suggested for safe computing here. You'll find some astonishing facts about internet use as well as some rules you may want to set up with your children to help keep them safe. Although there's no substitute for supervision, there are times when it isn't possible. The patent-pending ControlKey system simply plugs into the computer's USB port to provide advanced security protection. It works in conjunction with Windows software to provide access only to the user identified with the ControlKey and with the right password. As the key holder, you can program the system to provide as much, or as little, access to individual users as you see fit. When you remove the ControlKey token from the USB port, ControlKey locks down Internet access so that you can easily control when and how long your children are able to use the Internet. 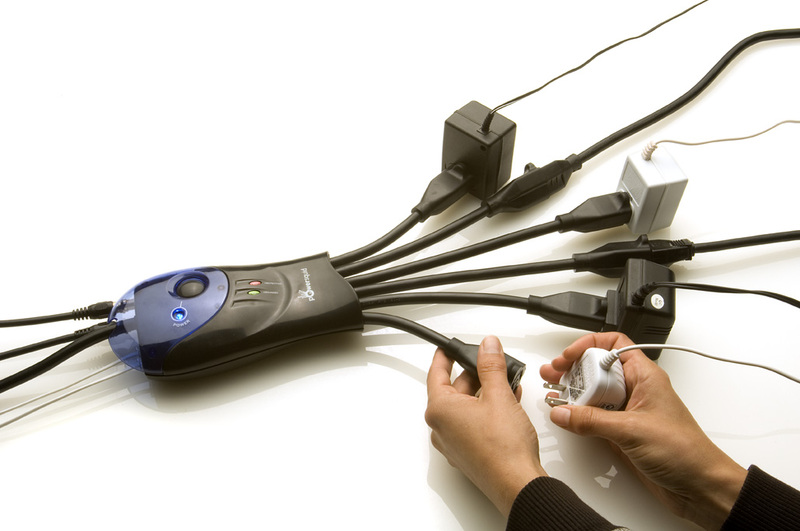 When the ControlKey token is plugged into the USB port, you can use all of the computer and the Internet like normal. However, once the ControlKey token is removed, the computer operates in restricted mode (based on guidelines you can customize) and doesn't allow Internet access. That way, you know that if you have the ControlKey with you, your children are not online without your permission. The ControlKey System is based on Griffin Technologies popular SecuriKey® technology and over 10 years of experience in providing computer security solutions to businesses. SecuriKey is a small USB token that, when inserted into your computer's USB port, acts like a key that allows you to access your computer. It's simple to install and simple to use. Installation is wizard driven and takes about 5 minutes. 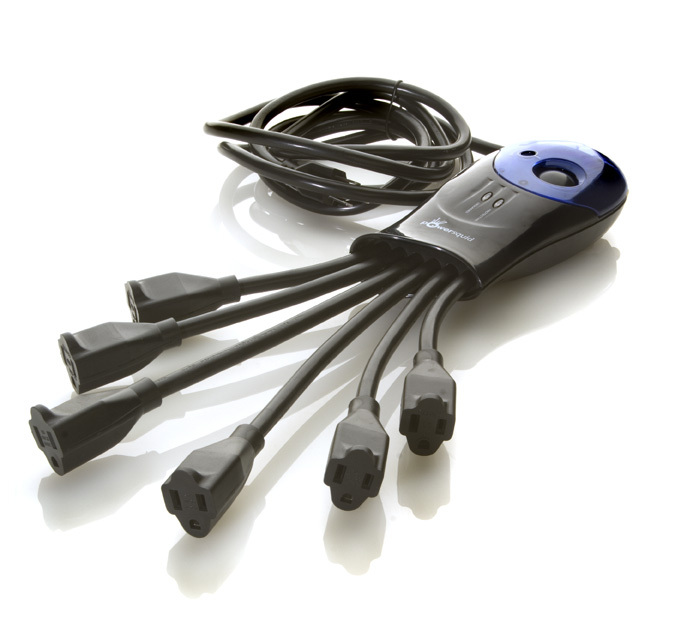 To use SecuriKey, simply insert it into any available USB port on your computer and type in your password. If you need to leave your computer (to go to a meeting or out to lunch), simply remove the SecuriKey token and your system locks until you return. Insert the token and type in your password and you are right back where you left off. No waiting for system reboot, and your system is safe while you're away. Available in both a personal and a professional model, it's another way to help secure your computer from unauthorized use. SecuriKey Professional Edition is the right solution for any organization with confidential or proprietary data that is important to the continued success of that organization. Gyration - Although I admit I haven't been a big fan of wireless keyboards and mice, primarily because of the battery use, Gyration's Compact Keyboard has changed my mind. I love the feel and size of this keyboard. Small enough to be carried along in a Tablet PC case, it's lightweight enough not to be noticed in the briefcase. Gyration uses high-quality scissors style keys for the feel of a full-size quality keyboard and whisper quiet keying. This keyboard is as small as many portable keyboards but has the feel and touch of a full-sized keyboard. As it's wireless, it's a perfect companion for Tablet PCs. 15 additional buttons across the top of the keyboard provide instant access to searching, browsing, sound volume, tracks and email. The accompanying Ultra Cordless Optical Mouse lets you pick up your mouse and sit back, relax and use natural hand movements to control the cursor. Whether you choose to use the mouse in the air or on the desktop, it's excellent for surfing or gaming without causing problems with repetitive motion. Laptop Legs -the newest addition to this list, is a definite must-have for all Tablet PC and other mobile computer users. As soon as I saw them on a Tablet PC at Microsoft's Mobile Partners Conference, I knew that they'd be something we all could use. There's even a version for Macs. Read my review of this innovative product by clicking here. Norazza - Not sure where to start with the items this company carries. Almost everything is usable with Tablet PCs, from the cases to the card slot and screen cleaners. I'll start with security. What do you or your company do with those outdated CD or DVD backups? Toss them out? Sensitive data can easily be recovered. Break them? They shatter as glass. Norazza has come up with an excellent device for your use. The cost is minimal considering what it does. Data Destroyer is the safest and cleanest way to destroy data on CDs and DVDs. It removes data from both sides of the medium. It destroys 15 disks per minute. Perfect for use by Accountants & Financial Institutions and Businesses & Executives for Personal & Business Financial Records, as well as by Government & Military, Home & Personal Security, Medical Offices and IT Professionals. Interesting data from Norazza's website includes info such as 1) Americans bought nearly 8 million paper shredders in 2002. What about the data on optical disks? 2) A single CD holds the equivalent of approximately 80 four-drawer filing cabinets filled with documents. 3) One side of a single DVD disc holds about 560 four-drawer filing cabinets filled with documents, or the capacity of 7 CDs. 4) Identity & data theft are one of the fastest growing crimes, with an estimated 700,000 consumers victimized in 2001. All computers need cleaning eventually. One item that's been overlooked up until now is the card slots. Norazza has again come up with an innovative way to keep slots as clean as the rest of our Tablet. These Digital Cleaning Kits for digital personal electronics with flash media memory card slots have between 15 to 19 pieces, depending on the kit. The Cleaning Card fits in the media slot, just like any regular digital media card!! 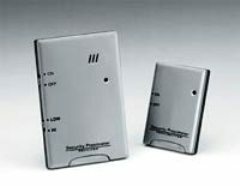 The Card Slot Cleaning Card cleans and polishes INSIDE the media card slot and is good for up to 20 cleanings each. Made originally for cameras, these are indispensable to help keep all our card slots, (Compact Flash, SD/MMC, Memory Stick, Smart Media and xD Picture Card) protected from rust, dirt and carbon buildup. Another favorite are the cleaners for use on Tablets and other computers. From anti-static wipes to air dusters and screen cleaners, Norazza has a product that will help keep your Tablet clean. Planon System Solutions has one of the most innovative products I've yet seen. It almost has to be seen and used to be believed. Docu-Pen is a portable scanner that weighs only 2 ounces yet can scan a full page in 4 seconds and store up to 100 pages. It's the perfect add-on for those who want a lightweight scanner. Students and other researchers will find it to be one of those products they won't want to be without. This product is the ideal portable scanner for business executives, lawyers, mortgage brokers, real estate agents, sales people, construction, architects, engineers, accountants, insurance adjusters, government, teachers, students, and more. The DocuPen can be used to scan newspapers, magazine articles, books, notes, receipts, contracts, sketches, important documents, certificates, blueprints, maps, reference material, etc. and comes complete with image and free ScanSoft PaperPort software that includes OCR capability. Although I generally don't do a lot of scanning, the portability of this makes it something I'll want to carry with me for those times I may need one, like finding a great reference for Tablet PC use in a magazine I'm reading. 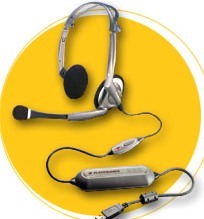 Plantronics is one of the best-known names in headsets and what I've often recommended to users looking for a suggestion for a headset to use with speech recognition on a Tablet PC. The one that's made the Editor's Favorite list is the the DSP-400. It's foldable for easy storage and transport and fits easily in a case with a Tablet PC. It has full digital audio so it does double duty as great headphones for full-range stereo sound. The noise-canceling, ultra-sensitive, digitally-enhanced microphone delivers the full spectrum of the human voice so it's an excellent choice for use with speech recognition. It uses lightweight materials for comfort and the QuickAdjust microphone boom allows the user to position the microphone easily. It's only drawback is that it isn't wireless, but regardless, the features it includes makes it perfect for Tablets. Road-Wired - (Editor's Favorite) The Roadster case is one of the best quality cases I've yet had the pleasure to use - from the adjustable hide-away handle to the sturdy wheels. There's a handy configurable section with velcro inserts that makes it easy to organize camera equipment or the wires and add-ons that we always seem to need to carry with us. 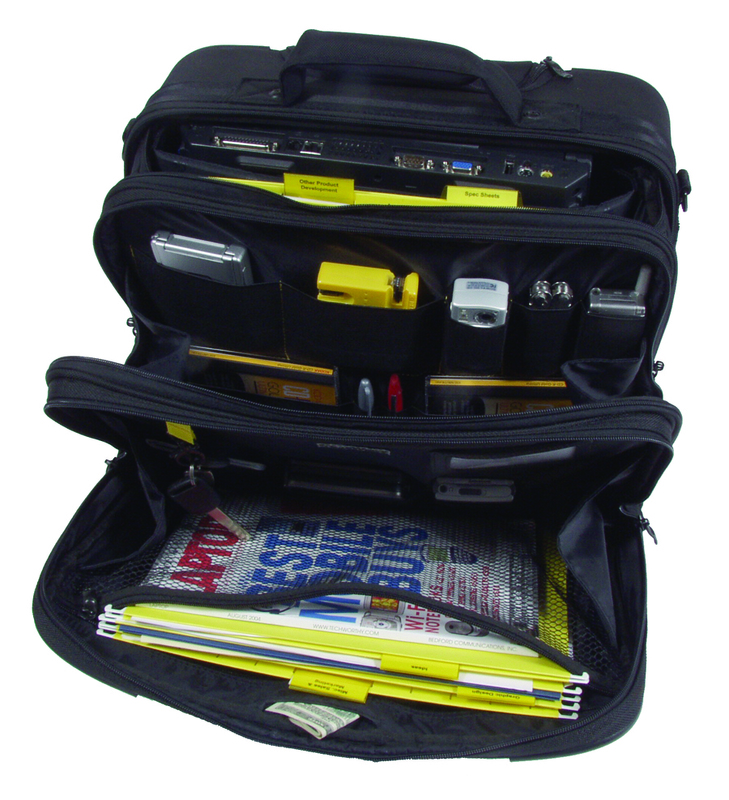 The unique RoadWired Transit System (RTS) insert for your Tablet PC or notebook gives instant vertical or horizontal access from within the case. The RTS can be removed so you don't have to carry an extra case when you don't want to take the rolling case. Swissbit offers different USB memory. 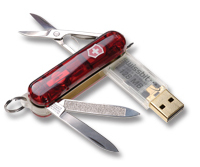 USB Memory Storage SWISSMEMORY TM (Editor's Favorite) is a unique combination of Swiss Army knife functionality and the added bonus of USB memory storage, currently available up to 512Mb. This quickly became an Editor's Favorite! The small all-rounder integrates numerous useful tools and is available in two versions: one with a stainless steel knife, scissors, a file and a screw driver, LED light and pressurized pen, the other with only the light and pen. With the removable memory, it's easy to take it all with you, just pack the knife portion in your suitcase and keep your data with you! Wacom makes pens for almost every Tablet PC. Without a doubt, the best of these to come along is the one made in cooperation with A.T. Cross. These pressure-sensitive Executive pens with Eraser feel absolutely perfect in my hand. Handwriting flows effortlessly across the screen and the substantial feel of the pen makes using the pen for browsing even more intuitive. Available in two models, one with a removable cap with pocket clip and another with the clip attached securely to the pen, one is sure to be the perfect pen for you.